Carmen Beauchamp Ciparick, Senior Associate Judge of the Court of Appeals, was born in New York City in 1942, grew up in Washington Heights, graduated from Hunter College in 1963 and received her J.D. from St. John's University School of Law in 1967. She served as a staff attorney with the Legal Aid Society in New York City from 1967 to 1969 when she became an Assistant Counsel for the Judicial Conference of the State of New York; in 1972, Chief Law Assistant of the Criminal Court of the City of New York; and in 1974, Counsel in the Office of the New York City Administrative Judge. In 1978, she was appointed Judge of the Criminal Court of the City of New York, and in 1982 was elected to the New York State Supreme Court. 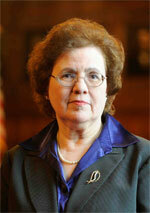 She was appointed to the Court of Appeals on December 1, 1993 by Governor Mario M. Cuomo. She was re-appointed by Governor Eliot Spitzer in November 2007 to serve until December 2012. She lives in New York City and has one daughter.